Design photos, ideas and inspiration ! 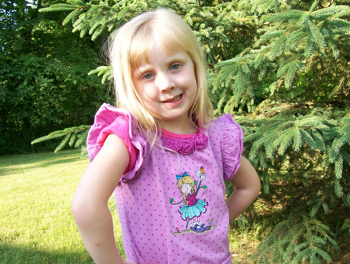 Juliana modeling her Vintage Shoe Fairy outfit that she received for her 4th birthday ! 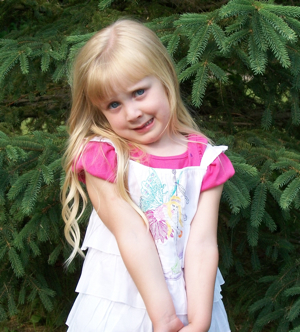 What an angel she is !!!! 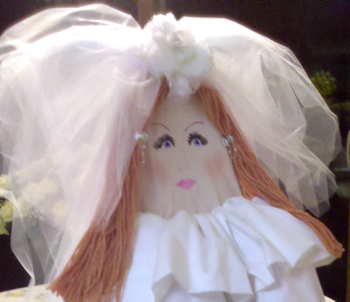 Bride's face by customer request,(a Needle Little Embroidery exclusive) original art digitized for Kathy who makes and sells these beautiful "Brides". 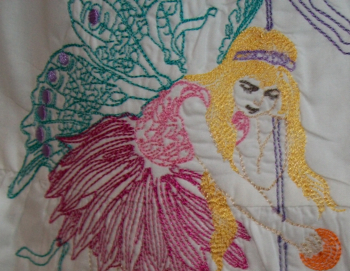 Each bride is actually an ironing board adorned with bed sheets to create the gown for this beautiful and unique bridal gift. 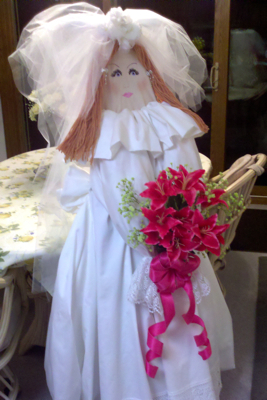 Kathy reports that many brides -to- be so love their new ironing board brides that they cannot bare to take them apart! That's one way to get out of ironing !!! Thanks for sharing Kathy. What a wonderful and so very unique gift! Juliana modeling another selection from our children's category entitled Happy Mother's Day, an adorable pig-tailed darling, shyly presenting a flower for mom. 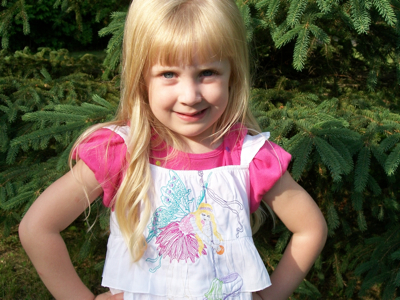 Beautiful Juliana, thank you for another wonderful picture ! 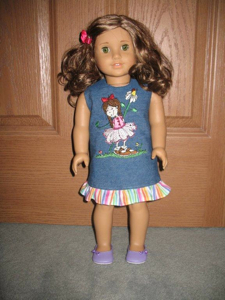 Here's another contribution from Tania who used this same design to make her daughters dresses for their American Girl dolls. 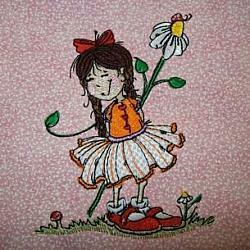 Beautiful job Tania, the dresses are adorable! I'm sure the girls love them. Thanks for sharing ! 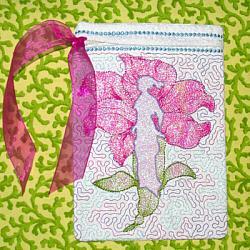 Good luck in our monthly drawing for sharing your projects. 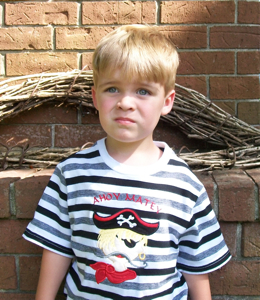 Two designs, two pictures means 2 chances to win !!!! 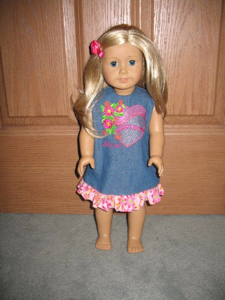 And here's the 2nd doll using an NLE Freebie. 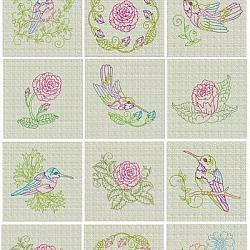 If you don't already have yours be sure to visit the FREEBIES page and download this free design today! 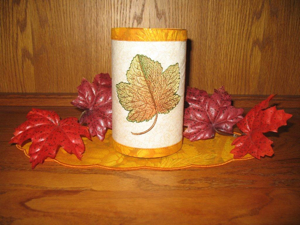 Then send in a picture of your finished project for your chance to win in the next monthiy drawing ! Next we have Blackbeard a.k.a. 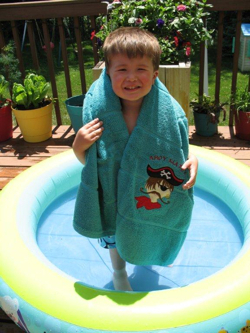 Austin ready for another roaring round in the sea, complete with his pirate essentials, the trusty towel featuring the appliqued pirate, located both in the children's and the applique categories. 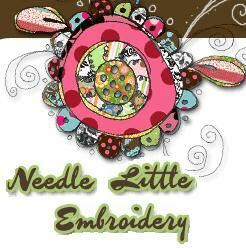 This pirate is another Needle Little Embroidery exclusive, drawn and digitized by me, he won't be found on any other site ! 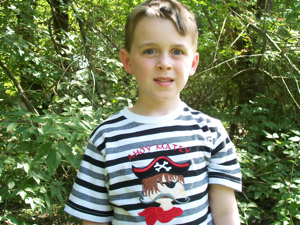 AND ANOTHER FINE PIRATE ! Here we have Brennan and Derek, brothers and mateys. Ship Ahoy boys. I think you are the real treasures ! It's safe to say that X marks the spot you hold in your mother's heart! Thanks for the great photos Mates ! Hope your ship comes in ! AND DEREK A BLOND MATEY ! 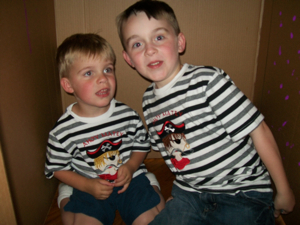 BRENNAN AND DEREK IN THE PIRATE HIDE AWAY ! 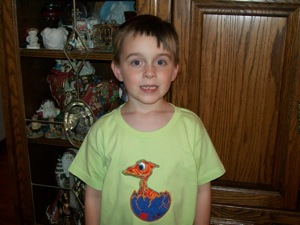 And here is Brennan once again. 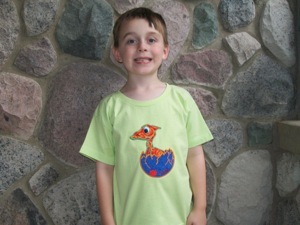 This time sporting our darling dinosaur hatchling and showing off his 1st lost tooth ! Congratulations Brennan, hope the tooth fairy was good to you! 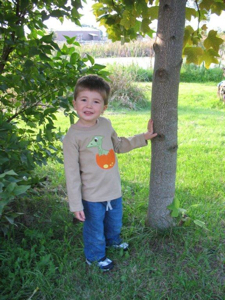 Below is another shot of Brennan in his new favorite shirt and beautiful toothless smile. 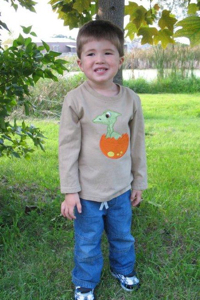 And here's Austin again also sporting our Dinosaur Hatchling Applique! 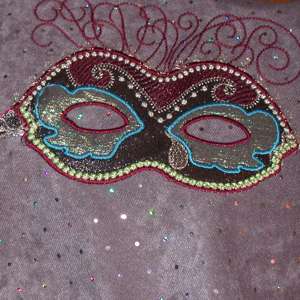 HERE'S ANOTHER PHOTO OF THE MARDI GRAS MASK SENT IN FROM LINDA CALDWELL OF COAL CREEK CANYON CO. LINDA IS CREATING A WALL HANGING USING BOTH MARDI GRAS MASKS ! MORE PICTURES ARE PROMISED WHEN THE PROJECT IS COMPLETE! 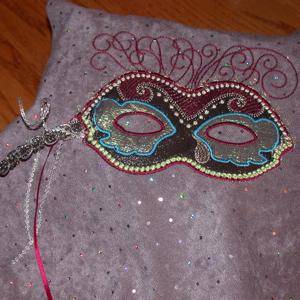 I CAN HARDLY WAIT TO SEE THE NEXT MASK AND THE COMPLETED WALL HANGING ! BEAUTIFUL JOB LINDA .. THANK YOU FOR SHARING ! 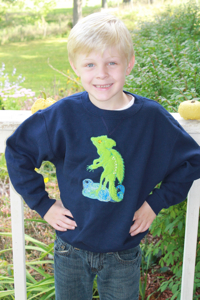 And here's Grant showing us his Basliisk Lizard sweatshirt, such a handsome guy. This Basilisk is an NLE special request design. 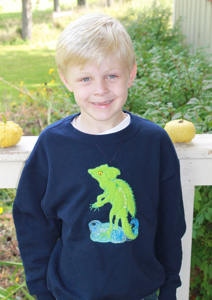 Grant is a huge Wild Kratts fan and the Basilisk Lizard is his favorite character from the show and he couldn't find him anywhere. NLE to the rescue ! 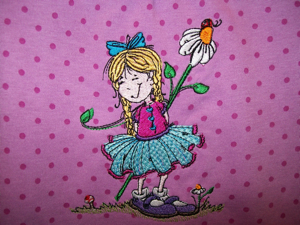 This is an exclusive NLE drawn and digitized design. 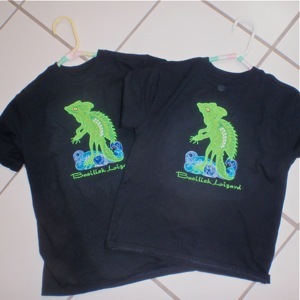 And here is a customer photo from Sharon Schroeter who made these Basilisk Lizard shirts for her two grandsons. I love the font she used to spell out the names. Great Job Sharon and congratulations for being February's random winner! Hope you enjoy your free design! 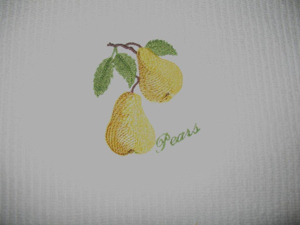 And next we have another submission from Tania, NLE Pears on kitchen towels. 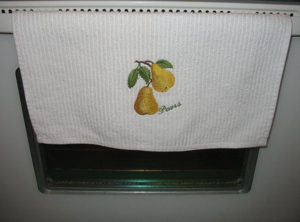 Notice how nice they stitched over the nap of the towels !